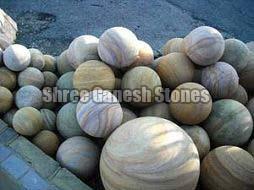 We have made our mark as Manufacturer, Exporter and Supplier of Sandstone Sphere from Rajasthan, India. Our team of dexterous professionals makes use of qualitative range of sandstone for their carving. Offered by us in ample of distinguished designs and specifications, our Sandstone Sphere offers oodles of charm to the position where these are placed. Our wide range of Sandstone Sphere includes Sandstone Leaf Ball, Sandstone Stripped Sphere, Groove Sphere, Sandstone Egg and Plain Sphere.